Off and Running with Mobile/Digital Now and EOP/AIM! This morning we handed out nearly 185 iPads to our incoming freshman class of EOP/AIM students. I was blown away by the amazing amount of work that was put into making this day a reality. We noticed a couple little bumps in the road, but considering this was our first time doing something like this it went incredibly well. I saw a lot of happy students and at the end of the day, that is what it is all about. Great work #SBUDoIT and the whole EOP/AIM team! 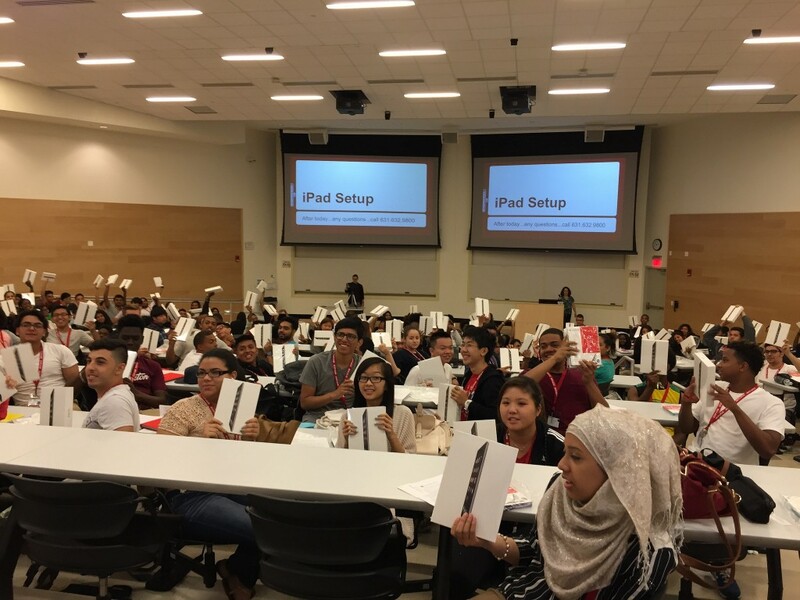 On Monday, July 6, Stony Brook University’s Mobile/Digital Now initiative will equip 185 EOP/AIM (Educational Opportunity Program/Advancement on Individual Merit) freshmen with iPads as they begin their four-year journey at the University’s Summer Academy. These iPads reinforce the University’s commitment to providing access to academic excellence for these freshmen. The Mobile/Digital Now initiative, led by Stony Brook Chief Information Officer, Cole Camplese, will help transform and reinvent learning environments and enhance access to anytime, anywhere learning resources. The Mobile/Digital Now initiative is also set to expand to support Stony Brook faculty in the appropriate utilization of technology to enhance teaching; will control costs of learning materials for students through eTexts; increase access of critical courses to enhance both retention and four-year graduation rates and equip the University community with the latest mobile devices that will aid in future academic success. The EOP/AIM Program provides educationally-related supportive services and supplemental financial assistance to those students whose educational and economic circumstances have limited their post-secondary educational opportunities. These iPads are distributed for students to use throughout their four-year undergraduate careers. There are so many reasons to be excited about this project. The first is getting to work with colleagues from EOP/AIM to help build an even stronger program. Another lies in getting to work closely with the students themselves. As part of the project I will be personally running a steering group made up of students in the program so I can maintain a finger on the pulse of the initiative and work with them to make it stronger. Finally, working with my DoIT colleagues to make this a reality has been inspiring! In a very short period of time we have worked to deliver the iPads under mobile device management tools, increased wireless density in key areas, and built new support modalities for our audiences. Really exciting stuff. The students will get their iPads and cases still shrink wrapped in the boxes. They will get to open them, turn them on, and have a fully functional iPad with both Stony Brook and commercial apps auto installed as well as access to additional academic content. All of these will be pushed directly to the devices as they activate them — even their University email will be auto setup. I can’t wait to see it all unfold. Below are screenshots of what they will see as their devices activate. Great work everyone! If you want to know what keeps CIOs up at night the list starts with information security challenges. To that end, I want to make this as clear as possible … it is time we all make information security a priority in our work. While we are committed to a strong IS stance, we can do things that are low hanging fruit here at SBU — strong pass phrases instead of weak passwords, changing pass phrases on a regular basis, don’t leave your work station logged in when you walk away, update your operating system when prompted, question links in emails, keep virus protection software up to date, and in all the instances when you are unsure of the legitimacy or threat ask a colleague who might have an answer. It constantly amazes me at how much doing just those things systematically can positively influence our overall security stance. I am asking for your help and your cooperation to take personal responsibility for assisting the campus and to make it a conversation about all of us and not one about information security against us. A few weeks ago, Stony Brook student Cam Boon stopped by my office to do this interview. I quite enjoyed his reporting on the current and future of learning spaces at Stony Brook. I could sit down and talk space design all day … it is one of my favorite topics.